Skeptic paper on Antarctica accepted – rebuts Steig et al | Watts Up With That? In a blow to the Real Climate “hockey team” one team member’s paper, Steig et al Nature, Jan 22, 2009 (seen at left) has been shown lacking. Once appropriate statistical procedures were applied, the real data spoke clearly, and it was done in a peer reviewed paper by skeptics. Jeff Condon of the Air Vent writes via email that he and co-authors, Ryan O’Donnell, Nicholas Lewis, and Steve McIntyre have succeeded in getting a paper accepted into the prestigious Journal of Climate and asked me to re-post the notice here. The review process was difficult, with one reviewer getting difficult on submitted comments [and subsequent rebuttal comments from authors ] that became longer than the submitted paper, 88 pages, 10 times the length of the paper they submitted! I commend them for their patience in wading through such formidable bloviation. Anyone want to bet that reviewer was a “team” member? As WUWT covered in the past, these authors have demonstrated clearly that the warming is mostly in the Antarctic Peninsula. Steig et al’s Mannian PCA math methods had smeared that warming over most of the entire continent, creating a false impression. Some of you remember that we intended to submit the analysis of the Steig Antarctic reconstruction for publication. That was quite some time ago . . . and then you heard nothing. We did, indeed, submit a paper to Journal of Climate in February. The review process unfortunately took longer than expected, primarily due to one reviewer in particular. The total number of pages dedicated by that reviewer alone – and our subsequent responses – was 88 single-spaced pages, or more than 10 times the length of the paper. Another contributor to the length of time from submission to acceptance was a hardware upgrade to the AMS servers that went horribly wrong, heaping a load of extra work on the Journal of Climate editorial staff. December 1, 2010 in Antarctic, Science. ← What's the best way promote reducing CO2 causing combustion? Congratulations! The sun is rising! But do you know why the Antarctice Peninsula is warming? What does this do to the overall antarctic trend? Wanna bet that is the coldest year in Antarctica in the 20th century. I guess I hadn’t really known of the existence of Stieg 2009 but I had come across the idea that antarctic warming was focussed on the penninsula. In fact I’ve always assumed this was the mainstream position. Has Stieg et al 2009 ever had any impact in antarctic research? This is a fine example of how the scientific method is supposed to be applied. The process in general works. Sometimes it just takes an extraordinary mount of effort though. I will examine your paper carefully and completely. Work like this deserves nothing less. We assume this paper’s new-and-improved techniques will be consistently implemented with integrity by AGW catastrophists heretofore unaccustomed to heeding any conclusions but their own. Or will cold-is-warm, flat-is-round, up-is-down themes continue to clog Warmist arteries it always has? My feeling is that Dr. Broccoli did a commendable job of sorting through a series of lengthy reviews and replies in order to ensure that the decision made was the correct one. Watch your backside Dr. Broccoli. The team is sharpening their knives. Very interesting. I have no idea who is right. But, both papers conclude Antarctica is warming. Congratulations guys! I followed this closely at the Air Vent while you were doing the analysis, it was a totally impressive collaborative work back then, and a blast to watch. I have no idea how you managed to condense it to under 10 pages, but I look forward to reading it when its published. I was blown away by your amazing analysis. Steig’s was quite an impressive piece of work too if you ask me. I’m glad you were able to refine and improve it. Very nicely done! “I’ll keep it out somehow.”? Love to be able to see some back n forth emails. Many kudo’s to all involved! Anthony, summat trivial here, but what appears to be an inconsistency. In your write up it sounds as if the ‘sticky’ peer reviewer submitted 88 pages, where in the author comments following the abstract (did I miss where it said who actually wrote that bit? ), it looks as if there were 88 pages total including both the peer reviewer comments AND the author replies…. Question for all… anyone know why that larger cooling area might be occurring? I mean, are there topographical features that would account for it, or ?? My first thought had been perhaps that area was generally significantly higher altitude… So I did a quick google for Antarctica topo, without much success – or does Antarctica really have no significant altitude differences across virtually the entire interior as the topo’s I found seemed to show? Also, can these same methods be applied to the Arctic to obtain any better results than those currently used? I am assuming, or at least hoping that a Letter to the Editor of Nature is now either in progress or contemplated. I wonder if a front cover has ever been retracted before ?? It’s nice to be diplomatic and all that, but my own personal view after reading Steig et al., when it first came out was that it was another example of the scientific fraud permeating the climate science industry. ….. and I have seven papers in Nature. Real ones. Well done gentlemen! I can’t wait for the meat and potatoes. We can only hope as more and more skeptical papers get publish the acceptance of skeptical opinions will become more and more prevalent in the climate science community. Given the hoops you had to jump through, it must be very gratifying. This is a signal event. The wall has been breached. Whereas papers like this could be suppressed before, the post-climategate environment is more open. The debate has, at last, been joined and the believers and the skeptics are moving onto a more level playing field. I really feel sorry for the folks who had grown accustomed to having everything go their way. This will not be an easy adjustment for them. The responses to this paper may not be civil. First up – congratulations and thanks. I think that the information content of the new paper that could be applied to understanding the underlying causal factors looks very different to the Steig et al Paper. I think it is safe to say given the review process that COLMc paper is right. Peer review rarely includes more than three appraisals… a fourth reviewer (in addition to the associate editor) is really exceptional. I followed the original investigation of the Steig paper at ClimateAudit and it was an exciting process. Steig didn’t provide critical information to aid in the analysis of his paper, so it took time for people like Ryan, Jeff, Jeff, Roman Hu and Steve (apologies to those I’ve omitted) to figure out how Steig et al had reach their conclusions. I remember well the day that they “broke the code,” so to speak. Congratulations, Ryan et al. Much can be accomplished when good, talented people work together in pursuit of scientific truth. The fraud about what has been happening in the Southern Hemisphere has been perpetrated for far too long. The record colds, some of which seem to predate Western style measurement , have been purposely ignored. Yet there is a fair chance that it is the water volume in the Southern Hemisphere that ‘controls’ the average temperatures, major temperature balancing, etc. around the globe. Rather than the largely regional effect of Arctic ice, etc.. This is a good start. The headline of this article “…rebuts Steig et al” is surely an example of what he hopes will not happen, and will set a trend. Can it be changed? 88 pages of review dialog? I’d love to see it. Do all the reviewers get to see the others’ reviews? They, and especially the fourth, would be on notice to review things carefully. Oh well, congratulations to the authors for seeing it through. I like the increased warming on the peninsula, it seems to fit what “everyone” has been saying! Looks like a little hiding of the decline going on at the South Pole. There is no warming going on in the antarctic interior. It is cooling. The antarctic interior is ostensibly the best place on the planet to observe the isolated effect of CO2. It is isolated from intrusions of warm air by a barrier called the antarctic vortex, it’s the driest place (by far) on the planet with less than 2mm average annual precipitation. One can easily examine the Vostok surface temperature record from 1958 to 2009 and see there has been no warming. The only speculation I could find about how this is possible is a story about change in the ozone hole that increased the strength of the vortex and with the strength of the barrier to warmer air moving in from nearer the coast. Variations in ocean temperatures also play a significant role around the antarctic. The Antarctic Circumpolar Current (ACC) is a dominant feature of the region. The areas of warmer waters embedded within the ACC have to pass through the choke of the Drake Passage and can maintain higher temperatures surrounding the region of the Peninsula for years at a time. if I remember the discussions, the most important point in my view with respect to AGW was a positive trend over the last 50 years, but a NEGATIVE trend over the last 40 years or so. Did you include this in your paper ? IIRC, Steig himself said the warming trend he derived wasn’t enough to melt the Antarctic ice cap anytime in the next few centuries. I’m often amazed at how Trenberth can put his finger on the key point occasionally! How does a new Nature study conclude that Antarctica is warming when actual temperature readings show it is not? It is official; BBC News have just told us that the record low temperatures are due to …. I would hope that our paper is not seen as a repudiation of Steig’s results, but rather as an improvement. Unless Anthony Watts is setting up the likes of Joe Romm and Gavin Schmidt for a ‘gotcha’ moment, a correction to the title of the post is warranted. BTW, had the order of publications been the other way round, that is, had Steig been the most recent paper, then Joe Romm would burst out into the streets yelling “O’Donnell, et al, is the most debunked paper in Antarctic climate research. See, Lucia’s “Most Debunked X in Y”. Congrats to the paper. I guess it makes more sense than Steig – even the blog posts on CA did make more sense. Still, while “Journal of Climate” may be “prestigious” in some sense, it is surely less famous than Nature. So something is still surely wrong when in recent 2 years, the bad analyses of a topic are published in Nature while the more accurate ones “only” appear in Journal of Climate. This is surely no reason for celebrations of the institutionalized science progress. There’s almost none. Another exposure of strangled, manipulated data being used to prove a fallacious climate hypothesis, brilliantly summed up by the expression ‘Mannian maths’. Another inconvenient fact is the growth in extent of Antarctic sea ice over the past 30 years. This from http://paroscientific.com/autoweatherstation.htm may also help explain something. I am really impressed by the tenacity of this team of authors. It’s a sad commentary on the state of peer-reviewed climate science that it took so much determination to get this article published but I applaud them for it. Great work and thanks for your efforts and dogged determination! I can’t wait for the Steig et al response at RC. Any bets on it being ignored at RC? i for one cannot wait to read this. Interesting how it seems you met significant hurdles getting the paper published/past review, one wonders if a non-skeptical paper would have recieved such opposition…. And Eric Steig’s response is?…………………………..
BBC scientific argument: It’s obvious init? The low temperatures are bad, global warming is really bad, so they kinda the same init? I just wanted to change the channel to something that would really shock and scare me. I had been watching CNBC World financial channel. I already knew about all that bad stuff and knew how devastating that would be. But I wanted something that would really scare me so I turned to the Weather Channel, having a feling. It’s only the beginning of December. It would be interesting if an expert on the sociology of science (such people do exist) were to investigate the peer review process for papers on climate change and compared sceptical papers with those upholding the “consensus” view to see if double standards applied. I think we know what the results would be but it would be interesting to have firm evidence. Excellent post! Well done to all concerned, just shows what good science & perseverance can do! BTW the global warming has finally reached Devon big time, further west than the Met Office’s prediction last night of only reaching Dorset. Why is nature so fickle in not following their predictions, shame on you Gaia! :-)) According to Vicky Pope this is just natural variation, so why is a warm year global warming, & a cold one natural? Is this the acceptance of common sense or just a sop to keep the climate realists quiet? We will see as time unfolds. The Antarctic peninsular is north of the antarctic circle and has water on three sides. So would be warmer than the rest of the continent. Since antactic sea ice is extending I would guess that things are getting cooler. There is coal to be found there so it was warmer there in the Jurassic/Cretaceous when these trees grew there. (Antarctica was also further north than today and joined to Africa/India before the Atlantic started to open). One supports local warming. One supports global warming. The nature of the “warming” is critical. Localised warming is perfectly acceptable without accepting CO2-AGW. However, CO2-AGW requires the Antarctic to be warming more or less evenly. Anthony being Anthony. “Why should I read the posts I publish?”. Well, the original discussion of the analysis wasn’t. Look at this RC post (the comment thread is short, but awesome). Scotland is freezin. Minus 22 in Altnaharra, but only minus 7 here on the east coast. It might be warmer in between though! To answer my own question earlier I just realised that the Steig warming pattern fitted really nicely with the estimates of Ice Mass Balance from the GRACE data. The Big blue blob on the west coast matching really well with Steig’s orange smudge. You guys know how to spoil a really good story. From what I’ve read here, it seems to me that Ryan is correct in his description. I think you should find a new title, or face accusations from the warmists that you are misrepresenting his paper. This is very similar to the problem of “numerical diffusion” that occurs in models of thermal-hydraulic conditions inside power plant piping. If you make a change to a component in one volume (even a small part of a pipe), the change diffuses throughout the system due to the numeric solution of the differential equations “smearing” the change across successive neighboring volumes, even if such a “diffusion” is not physically possible, or much faster than is physically possible. It is seen most often when a new chemical species in introduced into a fluid stream, like the injection of a boric acid solution into pure water. It is difficult to deal with, but is well known. I wonder how much numerical diffusion occurs in the GCMs. Disconnect between ice extent data and ice extent data. If you look at the error bars, you will find out that the improved trend is not significant. And if you read the “primer” amd start with 1980 instead of 1957 – what appears to be more important in the context of AGW – the trends are negative (even Steigs), and significantly negative. May I echo the suggestions already made in this thread re use of the term ‘rebuts’ in the header? How about ‘disagrees with’? In passing, I note that one of the co-authors of Steig et al (2009) is listed as ‘M.E.Mann’. While I’ve no reason to doubt that there is merit in the paper, the presence of this name among its authors does not inspire my confidence that its conclusions are to be taken without a heap of salt. Since there seem to be some general adherence to using screaming red and hot yellow to show positive changes wouldn’t it then be prudent to include a notice about the actual reference temperature anomalies these colored temperatures are relative too. Is it a wonder otherwise that media and propagandist just bend it however they please and let the readers imaginations do their job for them? A lot of people actually seem to believe these days that Arctic and Antarctic temperatures as well as high altitude temperature are now on the positive scale ’cause they’ve seen images of that. After all -43° +0.06° (in change) really do have a more positive effect on people’s minds. Another shout out here to change “rebut” in the title – you’re giving alarmists an open goal to shoot at and allowing them to shift the debate onto the (irrelevant) title of the post rather than the (important) substance. So why has the Antarctic Peninsula warmed whilst Antarctica has cooled? Simple as it may seem, the PCA seems prone to modelling and interpretational problems. I get the feeling that to use this method for critical statistical analysis requires insights that few, outside the group of specialists in field, master. This is what happens when prestigious scientific journals like Science and Nature succumb to the pressure of the “grant stooges” of the IPCC and thier circle of freinds dedicated not to the advancement of science but the politics of funding. Mentioning AGW in the grant application is why grey squirells can be studied in GB, cat population in Canada and cockroaches in Australia. Lindzen was right; if you want money to research anything you merely have to link it to the AGW conjecture and your chances for gaining funds increases in concert with your ability to create predictions of calamity due to it. and exposes important gaps in it as well how the “spin off” esclates from even smaller errors och miscalculations. There is an amplification factor involved when it comes to conclusions. I think this observation is very important.The “team” has taken any opportunity to draw extreme conclusions from thier work. So thats whats rebuted here. The new paper changes an important chapter of the “Global Warming Story. Congratulations Ryan, Jeff, Nicholas and Steve. 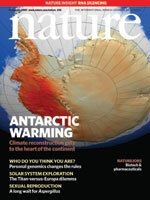 I can’t imagine how much work and perseverance it took to get a cover page of Nature corrected and the bastion of Team-climate-science set right in a major climate science journal. A great achievement really. Fantastic news! Well done guys. I remember when this paper came out…I was looking hard into the climate change controversy. I wasn’t sure who to believe. This paper came out, and I remember the immediate lashing it was taking on sites like this. I read the abstract and agreed it wasn’t much more than fancy guess work. Then I watched the Nightly News, and Brian Williams declared that a remarkable study has shown that Antarctica is warming too….yada yada. My jaw literally dropped. At that moment, I realized the sad state of how Global Warming is pushed by the media. Do you suppose if I watch Brian Williams tonight, he’ll mention this development? Right you are. IIRC, all the warming was between 1957-1969. For the last 40 years it has cooled. I hope this is highlighted in the paper. If it is, that would “rebut” what the original paper claimed since the original paper glossed over this important fact. Well done fantastic effort by all involved.The “Team” really needs to be aware of “Geeks” bearing gifts of this nature,how many more Trojan horse’s will they allow though before the gates are slammed shut… again to the sceptical argument?? Yes it’s rather embarrassing seeing someone put his foot in his mouth that badly. An unfortunate confusion on Bastardi’s part. I really hope Josh is going to wave his pen over this one. or perhaps Daniel in the lions den. Quite an heroic achievment considering the huge odds against. I wonder if that reviewer has ever had a climate science paper of his/her own given anything more than a rubber stamp. I often wonder about cold systems (IE the cold spot in Antarctica). Since it is common to expect both warming and cooling in an always unbalanced system, I wonder what would happen if that cold spot rotated to the Peninsula? And has it been centered there before? Has anyone ever said, “Let’s take a trip to Antarctica over the ice bridge”. What would be an excellent second paper would cover the atmospheric and oceanic conditions during this same time period. There is always a weather-related reason why one spot is warm while another spot is cold. First, I would like to thank everyone for the comments, and Anthony for the repost! a. Title of the post: I do not see any misrepresentation in Anthony’s use of the word “rebuts”. The paper is a rebuttal insofar as the specific methodology used by S09 is concerned. While I do feel that S09 made an honest – and quite clever – effort to reconstruct Antarctic temperatures, there are two unquestionable mathematical errors (S09 never properly calibrate the 1982 – 2006 portion of the principal components and allow the principal components to influence the estimation of ground station data). The former error has a material impact on the results. In addition, S09’s use of a heuristic thumbrule to determine the truncation parameters without investigating whether that thumbrule could be effectively applied in this case is another decision that should be rebutted in the peer-reviewed literature to prevent future misuse. The decision to predict the principal components without physical constraints provided by the satellite data was another suboptimal choice (though not an “error”). These points are specifically rebutted in the paper. In fact, these points are the whole reason the paper was written. The subsequent improved reconstruction exists only to show the magnitude of the effects of the errors and suboptimal choices. There is nothing inconsistent between “rebuttal” and “improvement”. “Repudiation”, on the other hand, implies that there was very little that S09 did properly, which would be a position I disagree with. There is much that S09 did correctly. b. Retraction of S09: This, in my opinion, is entirely unnecessary. If every time an error or suboptimal choice was found in a previously published paper a retraction were performed, there would be little extant scientific literature for anyone to read. Gross mistakes that overturn the primary findings of a paper (or fabrications) are appropriate for retraction. 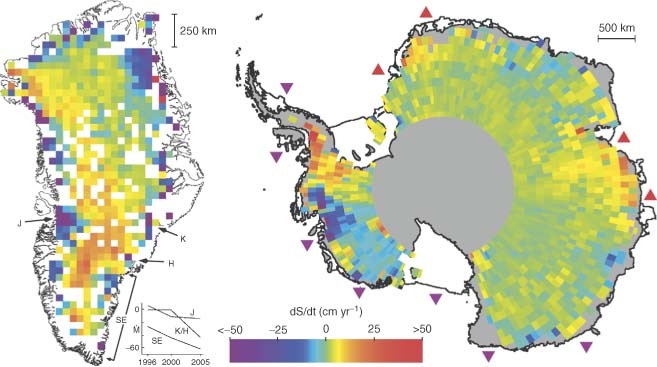 However, I do not consider S09’s errors and choices “gross”, and, even if they were, one of the most important differences between S09 and previous gridded Antarctic reconstructions (e.g., Chapman & Walsh 2007 and Monaghan et al. 2008) is that S09 find statistically significant warming in West Antarctica. This finding is not affected by S09’s errors and choices. Our reconstruction finds statistically significant warming in West Antarctica as well, albeit with a smaller magnitude. In addition, S09 found that the continent as a whole had warmed, which is a characteristic also shared by our reconstruction though at a smaller magnitude. December 2, 2010 at 1:29 am………..
Toto, thanks for posting that link to Eric Stiegs RC reply, – I usually avoid the place because of the rough justice and treatment of contrary views – but my, how they have ever so slightly cleaned up their act. but that dhogaza @1 June 2009 at 6:12 PM – is still the (self deleted!) embarrasment he is.!! Congratulations Jeff and Ryan for trying to politely and properly engage for the sake of the advancement of science, your efforts are appreciated. Look forward to reading the published paper. Ah hit the auto moderate bin for some reason and I deleted slimy! Yes, I was also awed by how short it was. If Steig had posted his analysis at ClimateAudit, the thread would still be active. I was also awed by Ryan O’s and Jeff Id’s posts, which surprisingly, were allowed by Gavin and Steig. Not everyone gets the chance to respond over there. Yes, it will be interesting to see what the response will be at RC after one of their bulldogs has apparently spent the past year trying to prevent the corrections to Steig’s paper from being published. Your skeptic independent paper is encouraging. Thanks and congratulations. Your transparency and openness is the real lesson that needs to be learned by those in support of the so called “RC Team”. Congrats! For as long as I’ve been following this on the web, for one from the “jesters” to be published… this feels like a real breakthrough. PS. You do realize, if he doesn’t find a way to nit-pick this paper to death (treatment they never seem to give to the “Team” work), Gavin is going to take credit for pushing you guys to do this. Just wait! I think Ryan is being far too polite (I guess intentionally, so as not to be confrontational and get this important paper published.). Without repeating the details shown in the above link , Steig 09 was an awefully sloppy piece of work. The most favourable way to view it they got the results they wanted with 3PCs and did not go any further, though it takes a load of credulity to not to think they tried using more. Almost doubling the period of the real data by projecting backwards in time as part of a calibration control is almost humorous. Seeing the net result was that there was not any warming on the Arctic peninsula when this was where all the data was and clearly showed warming … Well why bother publishing known falsehoods if you are not out to deceive? So hat’s off the authors of this paper for some credible analysis that actually ties up with reality. Congratulations for your perseverance and the fruit it has borne. I hope this signals the beginning of an acceptance of real science into peer reviewed journals. Long over due. With the current state of affairs at CoP16, will there be an AR5? Any sort of statistical detection/estimation process suffers the same problem. It’s not so much the method itself as application of the method. PCA is not some magical algorithm, in fact, it is quite common in a variety of fields. Indeed, solutions for PCA include eigenvalue decomposition, singular value decomposition, and even more recent developments such as the PAST algorithm which is used in communications applications. While not the best reference for detail regarding PCA, “Independent Component Analysis” by Hyvarinen, Karhunen, and Oja contains a brief overview of PCA as a pre-cursor to implementing ICA. They specifically mention some of the above, in particular, use of the PAST algorithm described by Yang in 1995. Complaining about grammar on WUWT and he can’t spell! To everyone saying “rebuts” conflicts with Ryan O’s call to not “repudiate” Steig, get a dictionary, because the two terms do not have the same meaning. A “repudiation” means that the paper has no merit, that all conclusions are wrong. A “rebuttal” means a counter argument or proposal, showing an alternative viewpoint. Anthony’s choice of terms is completely correct and proper. Repudiate –verb (used with object), -at·ed, -at·ing. See! Not synonyms, and the proper use was chosen by Anthony. Well done. I will read the paper once it becomes available online. I am surprised that no one has commented further on Roy Martin’s piece about the volcanism in the Antarctic and the Peninsular in particular. That the Antarctic Peninsular area is warmer than other nearby regions is well known and, from the link provided and elsewhere had been warming in recent times. The role of volcanic activity is significant. The crescent shaped Deception Island was mentioned and with a photograph as being a partly submerged caldera. Visiting tour ships operators encourage passengers to swim in the warm water of the ‘bay’ or inlet, as my wife reported from her trip there in December 2005. The position of the warm area of water does move about from time to time. It is a puzzle that Nature publishes papers which are contrary to known facts about regions of the world without due diligence and challenge by the so-called “peer” reviewers. I think a number of cases are accumulating, and the analysis might best be done with detailed case studies rather than a necessarily more superficial quantitative analysis. One thinks of my colleague Garth Paltridge who described at CA his experience in trying to get published that looked at 50 years of radiosonde data looking in vain for evidence that water vapour had increased with temperature (the key positive feedback mechanism in the models), only to be dismissed by one reviewer (effectively) for trying to undermine the consensus. Add the Climategate e-mails on trying to keep such research out of the journals (and out of the IPCC reports) and there is the basis for a good paper there. It all fits with the views of philosopher of science Paul Feyerabend that scientists behave like a cartel or club and defend their paradigms by fair means or foul. It might not matter much with some science, but in this case they are demanding society invests billions on the strength of it — and for this reason we have every right to insist on the openness and repeated attempts at falsification Karl Popper recommended. (It was not accidental that his philosophy of science resonated with his political philosophy in The Open Society and Its Enemies and The Poverty of Historicism). For years, Antarctica has been considered the one part of the world that global warming has left untouched. Scientists thought the icy continent at the bottom of the world was experiencing stable temperatures or even cooling slightly. This was considered an unalloyed good thing because it meant Antarctica’s massive ice sheets weren’t in danger of melting, unlike the rapidly disappearing sea ice around the Arctic. But now it appears that the view on the stability of Antarctica’s climate may have been wrong. ”We can’t be quite as comfortable in thinking, ‘Oh, at least Antarctica … is safe because it’s getting cold,’ because it’s unfortunately not getting colder, but getting warmer like everywhere else,” said Drew Shindell, an atmospheric scientist at the NASA Goddard Institute for Space Studies and one of the researchers who conducted the study. ”It’s a long-term threat, but given the magnitude of the threat, I would find it worrying” that temperatures are rising, Mr. Shindell said. Antarctica, as the only formerly uninhabited continent, does not have a long history of climate data and accurate records from weather stations have only been available since 1957. Most of the stations are located along the coastline, and do not give much of a clue about what has been happening to temperatures in the vast interior. Satellite data have been available only since the 1970s. The weather stations indicate that the Antarctic Peninsula, the long finger-like projection that points to South America, has grown warmer, but many other coastal stations have had slight cooling, leading to a belief that most of the continent was not being affected by global warming. Scientists also have found that the depletion of the Antarctic’s ozone has contributed to cooling since it developed in the 1970s. But Mr. Shindell said that if the new study had been available earlier, it is likely the IPCC would not have been so sanguine about the state of Antarctica’s climate. Because Antarctica has had only about a half century of weather station data, the researchers were unable to rule out the possibility that the raising temperatures they calculated were related to some normal, natural fluctuation in its weather patterns. The research was conducted by a team that included scientists from a number of U.S. universities and government laboratories. The group made their warming estimates by comparing data from both satellites and ground weather stations. They found that temperatures from the stations and the satellites corresponded, a finding that allowing them to infer temperatures in the vast areas of the continent that don’t have weather monitors. I do think we need more research into the cause of the antarctic peninsula warming. Is it due primarily to adiabatic warning from wind descending from the interior plateau or due to volcanic heat? The concurrent ocean warming makes one wonder whether the ocean or the winds are the culprit. I like Ed Caryle’s thesis of heating due to descending air masses. We know that mid latitude deserts around the world are due to descending air masses associated with Hadley cells which originate as ascending air masses or evaporative cooling at the ITCZ to the south and are completed with surface trade winds from ne to sw. Descending air releases heat and lowers relative humidity resulting in reduced cloud cover and associated solar heating. The question I have for Ed is can such a heat pump produce enough joules to actually increase OHC adjacent to western antarctica and the Peninsula? Don’t look now, but it is MY opinion that the warming is largely confined to the Palmer Peninsula. Indeed, no AR5 (or at the least a significantly postponed one) would be entertaining indeed. Actually I think this says when you correct the most obvious errors, such as selection bias and infilling errors, than most of the warming vanishes. It does not yet address the question of whether the method has other errors or even works at all. To qualify to be in their group, he would need to use the word repugnant. The warming in the peninsula was well known before Steig et al. 2009 (see Leroux various books, the latest being Dynamic Analysis of Weather and Climate, 2ed. Springer 2010) and can easily be explained through atmospheric circulation dynamics as warm air moist advections are channelized by relief as a result of stronger catabatic anticyclones coming out of Antarctica. In fact the same dynamic can be noticed along the Chilean coast where temperatures have been cold at sea level -dense cold air- while temperatures have risen in the mountains where warm air is advected against relief as the strong mobile anticyclone progresses north. It is also these warm air advections on the WA peninsula that bring record snowfalls there. Dr. Steig should at least know that depressions affecting the area are deeper and their frequency has been increasing, hardly a sign of global warming! I’d asked if there was any idea of why the larger cooling area exists within the continent, if there are topological features or something else that might account for it? I’d also asked if your improvements could be applied to how Arctic temps are being calculated – and my apologies, because I have no idea if some of the same Steig methods are even being used for Arctic calcs…. Then finally the request – if it’s correct that the majority of the warming has occurred decades ago as a few others have posted, could you favor us with at least the years that warmed along with how much (deg C/decade or year), and when that warming turned to cooling along with how much cooling from then to present day? I understand totally if that’s not possible because of publication requirements, but am hoping you’re not constrained in this regard and might be willing to post this info. Thanks so much, and again, many kudos on your paper and it’s publication!!! Thanks dbs – spelling has never been my forte, that’s for sure. I’ve no idea why I automatically put the apostrophe in, but hopefully I’ll remember in the future. I haven’t seen a misteak in AGES dbs – when I was a little kid, I had a ginormous eraser – like 6 inch x 3 inch x 1 inch, with MISTEAK printed across it. Thanks for the grin! Ryan and his co-authors deserve the highest accolades for not only for fixing the lapses in Steig’s Antarctic reconstruction, but for getting their paper past a hostile reviewer. I suspect that the latter was accomplished because they concentrated on methodological issues, rather than confronting the more substantive issue of data manufacture. PC methods work most reliably in the context of multiple (overlapping) data sets that may be somehow flawed, but in the aggregate contain ample information about the signal components. And derived EOF’s can be very powerful in compactly identifying complex modes of oscillation where such exist in a naturally defined space (e.g., a basin of water). But neither of these conditions applies to Antarctic temperatures, where only a handful of widely scattered station records cover more than 50 years. Aside from the recent satellite data, most of the other stations have significant gaps in their time series and average only ~30 yrs in length. Thus any EOF reconstruction of a 50-yr gridded record relies largely on data that is not a product of measurement, however flawed, but of manufacture by the algorithms employed. Despite the beguilingly detailed maps provided, no one with any sense of the dimensions–temporal and spatial–over which terrestrial temperatures are strongly correlated would take any such “recontructions” to the bank as physical reality. Whether Antarctica cooled or warmed on the whole in the recent past thus remains an open question. It is further complicated by the confounding mathematical effects of natural multidecadal oscillations upon multidecadal regressional estimates of trend. Not that it matters but pluralization does not get an apostrophe anyway, except with variables. Its looking as if Ryan (paper author) hasn’t checked back to the comment section since his last post… if possible, would you folks pass them my questions from post: Rational Debate says: December 3, 2010 at 6:22 pm and see if they’d be willing to reply? Thanks so much! FWIW it’s neither. Kudos in is a noun like “respect”. You don’t have one or many. You don’t have a kudos or many kudos, you may have much kudos. It comes from the greek word that is transliterated as kudos , the s is part of the base word spelling nothing to do with english suffix indicating plural. USAGE Kudos comes from Greek and means ‘glory.’ Despite appearances, it is not a plural form. This means that there is no singular form kudo and that use as a plural, as in the following sentence, is incorrect: : he received many kudos for his work (correct use is : he received much kudos for his work). P. Solar is right, ‘kudos’ is neither singular nor plural; that appears to be what dbs was trying to communicate, only he said it backwards. The original problem was using an inappropriate apostrophe [kudo’s]. Maybe this will help. honor; glory; acclaim: He received kudos from everyone on his performance. Both the singular form kudo and kudos as a plural are today most common in journalistic writing. Some usage guides warn against using them. “fame, renown,” 1799, from Gk. kyddos “glory, fame, renown,” from kydos “glory, fame,” lit. “that which is heard of” (see caveat). A singular noun in Gk., but the final -s is usually mistaken as a plural suffix in Eng., leading to the barbarous back-formation kudo (first attested 1941). What a crock ! That is supposed to be a dictionary? So because an ignorant common misusage thinks every work with an S must be plural this now becomes official ? BS. What the hell that has to do with Xeres or cerise beats me. NOTE: “French singular noun cherise” the dumb [/snip] who wrote this entry even got that wrong , the french word is cerise. So you can screw that online dictionary up and burn it. It’s probably been written as an off-shoot of Wikipedia: the online repository of human ignorance. If that’s the case we can all stop wasting our time arguing science and climate. CO2 ” has come to be widely regarded” as pollution and the cause of catastrophic global warming. It must be true. Well, gee, P. Solar, seeing as how you are so brilliant and all, as demonstrated in your post of December 7, 2010 at 2:14 am, one would think that it might occur to you that once a word, spelling, or phrase is in common usage for an extended period of time, now matter how it got there or how incorrect or what other language it came from, it actually does wind up included in dictionaries and becomes accepted correct usage. That’s how languages evolve over time, after all. One would also think that it might have crossed your mind that the current French word and spelling for ‘cherry’ just might not be quite the same as it was many years ago… and might also note that the word ‘cherry’ is spelled with an ‘h,’ rather than being pronounced and spelled cerry. That it might also have occurred to you to try looking up the history of the word cherise before popping off with such a derogatory dismissal. 1236, from Anglo-Fr. cherise (taken as a pl. ), from O.N.Fr. cherise, from V.L. *ceresia, from late Gk. kerasian “cherry,” from Gk. kerasos “cherry tree,” possibly from a language of Asia Minor. O.E. had ciris “cherry” from W.Gmc. form of the V.L. word, but it died out after the Norman invasion and was replaced by the French word. Meaning “maidenhead, virginity” is from 1889, U.S. slang, from supposed resemblance to the hymen, but perhaps also from the long-time use of cherries as a symbol of the fleeting quality of life’s pleasures. Cherry-pick, in a pejorative sense, first recorded 1972. As to what it has to do with pease, Xeres, and cherise (NOT cerise)? All you have to do is read what was already posted – pea, sherry, and cherry are all examples of back formations that occurred from those words based on the common usage and understanding of the language at that time, just as Kudo has been back formed from Kudos much more recently. Last I knew, science was a tool we used specifically to avoid human bias and error – where languages are clearly flexible and constantly evolving. Hard to conflate the two, and yet you manage it. Me, I’ll stick with keeping them separate, thank you.